This post originally appeared at Child Trends blog. Governments, schools, foundations, and nonprofit organizations fund programs to improve outcomes for children and youth, so it is important that these programs actually achieve their desired outcomes. 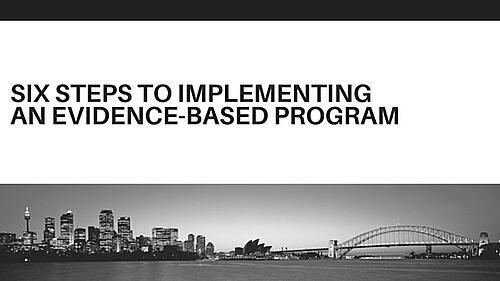 Just as in medicine, it is imperative to invest in evidence-based programs and practices. Whether it is an after-school program for youth, a teen pregnancy prevention program, or a mentoring program, success can depend on how well the program is implemented. You, the program leader, have spent time, money, and effort on researching and choosing a new program that you believe has evidence of success and is an improvement over the services you were previously offering. You purchased the materials, worked with the developer to train your staff, and are ready to go with the new program. You have turned it over to your managers and feel that your job is done. Well, not so fast. If you want to ensure that the program is implemented in a way that achieves the intended results for the children and youth you serve (referred to as fidelity), then your involvement is still needed. Ensure that frontline staff understand the theoretical basis of the program being used. When staff know why you have chosen a particular program and how it achieves its goals, then they will be more likely to buy into the program. Staff benefit from understanding the links between the program’s theory and activities, and how it can improve their work. The greater their buy-in, the less likely they are to create their own modifications. This can help to avoid program drift. For example, one child welfare agency trained all their staff in the Family-Centered Practice Philosophy prior to implementing Family Group Decision-Making Meetings so staff could understand the reason for the practice change. Select and train frontline staff carefully. Carefully consider which staff will implement the new program, always keeping in mind the best fit for the children and youth you serve. Be sure to offer trainings to new staff as they come on board, and also to existing staff that might need to improve the skills necessary for implementation of the program. This can avoid “drive-by” trainings that are forgotten very quickly and never incorporated into practice. Consider offering coaching to your staff. Coaching can reinforce the skills learned in training and can be done individually or in groups. Make sure that supervisors are familiar and comfortable with the new program. This will help them share their knowledge with staff, as well as support staff as they transition to the new program. It may entail extra trainings for supervisors and extra time allotted to supervision, especially in the beginning of the implementation. Supervisory hours may decrease over time, but it is important to implement your program consistently and with high quality at the beginning if you want it to succeed. Plan and conduct systematic program observations to assess quality and make needed changes.This is most useful for new staff or at the outset of implementation, but it remains important once staff gain experience with the program. In fact, when HHS Office of Adolescent Health decided to fund teen pregnancy prevention grantees’ program implementation, they required observations to be routinely conducted and documented using a fidelity log. There are many existing observation tools, which can be modified if one does not already exist for your specific program. When modifying tools, you can omit questions about elements that are not important to your program and add questions that are. Make sure observers are well trained on the tool. Also, ask your observers to take notes of both exemplary behaviors and problematic behaviors to share with frontline staff. This is to credit staff for positive practices, illustrate good practice to others, and highlight areas for improvement. Emphasize that the purpose of observation is to help staff better serve youth in the program. Establish a process of ongoing learning and reflection. This can include regular staff meetings to share experiences and discuss facilitators and barriers to the implementation of the program. It should also include conversations about adaptations staff want or need, and how such adaptations may affect the program’s integrity. This also requires establishing a regular process for giving feedback to staff, including opportunities for support and learning. Self-assessments can be coupled with supervisory assessments. Schedule regular meetings with the program developer regarding updates to the program. Sometimes program developers update their program model in response to advances in knowledge or lessons learned in other locations. Routine meetings with the developer help ensure you are providing the most up-to-date information and staying abreast of new developments. As a program leader you are committed to providing top-quality services to the children and youth served so that they can have the best outcomes possible. You select your programs carefully and thoughtfully, and with your ongoing support you can help ensure that your program is meeting its goals successfully. This post was originally written by Kristine Andrews, Program Implementation Matters Program Area Director, and Berenice Rushovich, Research Scientist at the Child Trends blog and can be found here. Learn more about NFI's evidence-based fatherhood programs at 24/7 Dad® and InsideOut Dad®.